In 2008, DOT repurposed street space at the Hub in Mott Haven to greatly expand and improve Roberto Clemente Plaza. The first version of the project was made with low-cost materials — paint, planters, and gravel. Afterward, the city committed to building out the project in concrete. But the agency in charge of delivering capital projects, the Department of Design and Construction, has been working on it for years and still has no definite timetable for completion. DDC broke ground on the project more than two years ago, with an expected 18-month construction timeline. Today the site is still a jumble of construction equipment and vehicles. Local retailers say the construction zone is an eyesore, providing cover to gangs and drug users and driving people away from surrounding businesses. 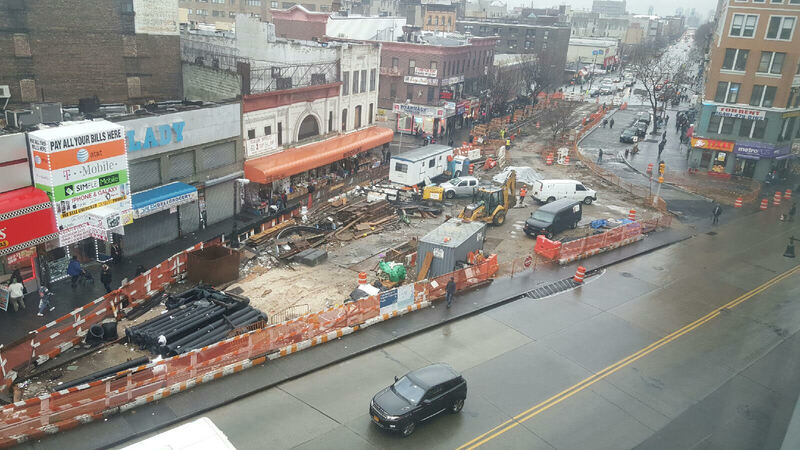 “General consensus is that this is a hellhole and there’s no end in sight,” Third Avenue BID Director Steven Fish told Streetsblog. Fish organized a forum in October for local business owners and residents to vent their frustrations with the project delays. Representatives from DDC attended the forum but could not give a concrete completion date, Fish said. DDC’s online database says construction will wrap by August, 2016, but officials at the forum said it was more likely to last through 2017. The idea for the project dates back to the early 2000s. 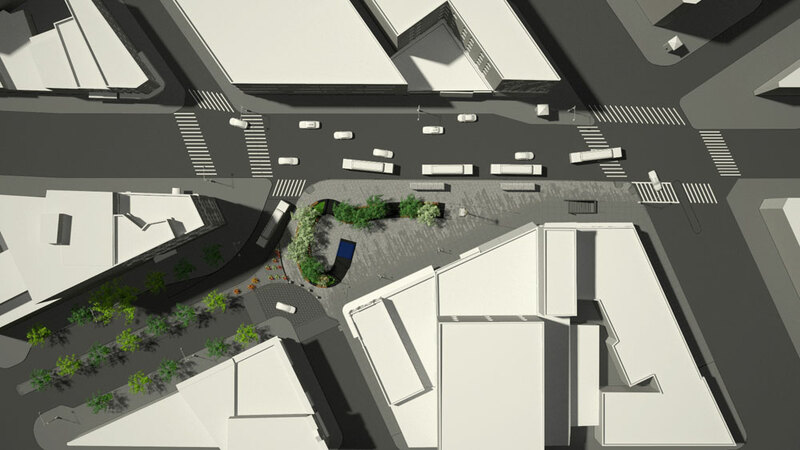 In 2008, DOT redesigned the streets in the area, known as “the Hub,” to be more pedestrian-friendly, increasing public space by 15,000 square feet with sidewalk and curb extensions, pedestrian islands, and the reclamation of car lanes to expand Roberto Clemente Plaza. In 2010, DOT proposed to improve the plaza environment through a $12.7 million capital project that would increase green space and seating zones. The 2008 improvements were lauded by local electeds. Local residents do much of their commercial shopping in other parts of the city, and the changes at the Hub were expected to bring that business back to the neighborhood. DDC’s interminable construction timetable has foiled those expectations. In lieu of a quality public space that attracts people from the neighborhood, the construction zone has repelled potential customers while providing a haven for illicit activity, according to Fish. Two businesses bordering the plaza have already shuttered, he said, and another has seen its profits drop by about half. The project is being built by Trocom Construction, which the city dropped from another delayed project earlier this year for undisclosed reasons. Streetsblog reached out to Trocom and DDC for comment but has yet to receive a response. DDC is working closely with our general contractor for a successful completion of the Roberto Clemente Plaza. Our contractor was experiencing financial difficulties and have filed bankruptcy. While there is no apparent work currently due to the holidays, we are working diligently with our contractor to complete this project and to minimize further delays. We will continue to remain good neighbors to the residents and businesses in the communities experiencing our construction activities. The sad part is the speed of progress here is all too typical of any number of ongoing projects. 50 years ago a project like this would have been done in a few weeks. Is anyone in a position of power ever going to find out exactly why infrastructure projects take so long and cost so much these days? Analysis paralysis and change orders. Time to sue. Here in California, it takes longer to build eight miles of light rail line than it did to build 800 miles of railroad back in the 1860s. Of course it was a lot faster when the builder could have the US Army clear away any recalcitrant native tribes, and the buffalo hunters could kill off any bison that got in the way. Nowadays between the various government entities, public utilities and NIMBY groups (and their lawyers), it’s no wonder that some projects seem to take longer than the Pharaohs took to get their Pyramids built. The Pershing Square work is taking an inordinate amount of time as well. This is very frustrating because E 148th St is an important low-stress alternative eastbound route to E 149th St.
Navigating the Hub can be dicey, even for an experienced bicyclists. There’s very heavy automotive traffic during business hours. Would it? Or are you just romanticizing the past? ~50 years ago is around when construction on the 63rd street tunnel started. Half of it is still unused. The other half took 20 years for partial service, another 10 to connect to QB. Maybe it’s time to take this stuff in-house. Have the city hire its own workers. Maybe 60 years ago would have been more like it. I know we did most things pretty fast at least up through the mid 1950s. IIRC the major cause of the 63rd Street tunnel delays was money problems, not an inability to get it done quickly. During the same era each of the original WTC towers went from breaking ground to finished in under three years. Which means it’s a management problem. Is anyone leading DOT? Same thing with Myrtle Avenue Plaza in Clinton Hill. But the staging area on Myrtle isn’t as bad as the photo in this article. This project is substantially over budget as well. Additionally no plan has been announced as to what agency will be responsible for maintaining the plaza, cleaning it and providing security once it is completed The new Tappan Zee Bridge will take less time to build and open than this plaza. What a shameful display of mismanagement! Richard Propper, former president of HUB 3RD AVENUE BID. The project was one of the first public space improvements identified by NYC DOT's plaza program, then became a poster child for the dysfunctional capital construction process at the Department of Design and Construction.